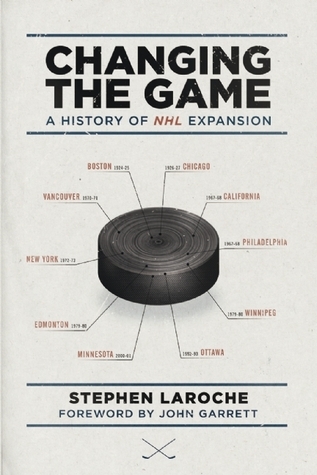 Changing the Game: A History of NHL Expansion celebrates an often-overlooked aspect of hockey history. The book provides comprehensive coverage of the NHL’s move into the American market in the 1920s along with the memorable expansions that began in 1967. Relive some great and painful moments from the debut seasons of forgotten teams such as the Montreal Maroons and California Seals along with fan favorites like the Boston Bruins and New York Rangers. Every player from every first-year roster is covered and nearly 100 players shared some of their memories of playing for hard-luck clubs. Additionally, readers can expect to find a great deal of relevant statistics to go along with outstanding photography. This book is filled with information on every hockey team before the original six up to today’s teams. There is some information on the top players from the team in each chapter of section, and of course I am sure it was difficult for him to settle on players from some of the better teams. It is really difficult to talk about every team and I was not expecting that. Though I was expecting a history book. He does take you from the early 1900’s through the 20’s to the original six and then on to expansion, the WHL, another expansion, and the lastly some of the newer teams. He goes over some of the players like I mentioned, and rule changes, but mostly it is filled with information about the teams and some of the early stars of those teams and how they came to be. An interesting book full of a lot of information. I got this book from netgalley. I give this 3 stars.